If parents are going to give their kids something big for high school graduation, it’s usually a car, right? Maybe it has bald tires and the seat covers are torn, but it’s got four wheels and the engine is sound. Or maybe they write a big check or buy you tickets to Disneyland. Or ????? Me, I got a sewing machine. And I was thrilled. It was 1970, still the days of long hair, short skirts and psychedelic colors. After two years of home ec classes, I was making most of my clothes. That machine, a putty-colored Singer Stylist with—ooh—a zigzag setting, was way better than a car. I had been sewing on my mother’s old machine, which had been my great-grandmother’s. My folks had converted it from treadle power to electric. I can still feel the rocking of that treadle under my feet and the cold steel of the wheel in my right hand. It worked well, but now I had my own sewing machine that I could use in my own room, and I couldn’t wait to get going. Hour after hour, I laid out patterns on the kitchen table, cut the fabric, pinned it and sewed it on my Singer. My sewing raised objections from the family during prime time because in those antenna-TV days, sewing machines and other appliances wreaked havoc with the TV picture and sound. But I sewed and sewed. I loved the colors, red, green, yellow, blue, and the fabrics, cotton, corduroy, velvet, satin. My clothes were always unique. Even if I used the same patterns as other girls and even the same fabrics purchased from the old House of Fabrics, I never combined them in the same way. In more recent years, I used the machine to make the quilted wall hangings that hang all over my house. I saved bits of fabric for decades, knowing someday I would use it. I used that sewing machine for 44 years, through 11 moves and two husbands. The initials I stitched inside the necklines changed three times, and still I sewed. In recent years, I didn’t using the sewing machine as much. I was busy with family and work. Losing my mother and mother-in-law, both avid needlewomen, took away some of my sewing mojo. Plus the machine was getting old and cranky. Finally, a couple weeks ago, after doing more cursing than stitching trying to make it work, I decided to look into new sewing machines. The result? 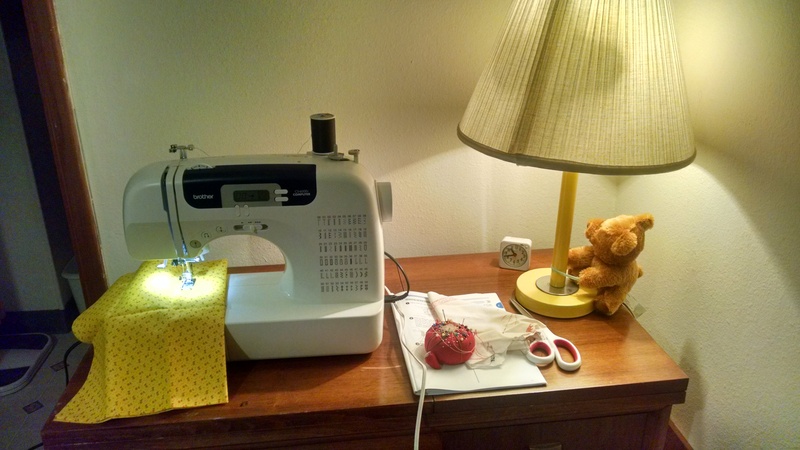 I’ve got a new Brother sewing machine sitting in the bedroom I am now turning into my sewing room. It’s computerized, it has 60 different stitches, and has push-buttons for everything. I was afraid I wouldn’t be able to work it, that it would be too complicated, but somehow, the basics are still the same. When I started sewing, my hands knew exactly what to do. And that machine hummed and sewed like . . . a Cadillac. I don’t know what I’m going to make yet. But I can’t wait to find out. And the old sewing machine? I don’t know what do with it, but as I told my 92-year-old father the other day, it sure served me well, better than any old car would have. Did you get a big present for high school graduation? What was it? Please share in the comments. omg, I’ve been eyeing the Brother CS6000i for a few months now…so nice to hear you love it! Happy sewing!